Barley (Hordeum vulgare L.) is an important crop in Tunisia, especially in the south, which is characterized by an arid Saharan climate. Water resources, when available, are saline. 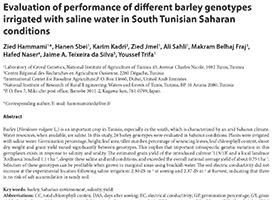 In this study, 26 barley genotypes were evaluated in Saharan conditions. Plants were irrigated with saline water. Germination percentage, height, leaf area, tiller number, percentage of senescing leaves, leaf chlorophyll content, shoot dry weight and grain yield varied significantly between genotypes. This implies that important intraspecific genetic variation in this germplasm exists in response to salinity and aridity. The estimated grain yield of the introduced cultivar ‘113/1B’ and a local landrace ‘Ardhaoui ‘reached 1.1 t ha–1, despite these saline and arid conditions, and exceeded the overall national average yield of about 0.75 t ha–1. Selection of these genotypes can be profitable when grown in marginal areas using brackish water. The soil electric conductivity did not increase at the experimental location following saline irrigation: 2.30 dS m–1 at sowing and 2.37 dS m–1 at harvest, indicating that there is no risk of salt accumulation in sandy soil.